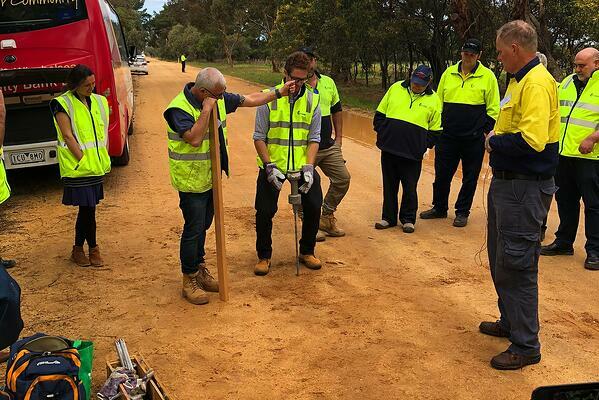 ARRB is pleased to offer a two-day training workshop on the latest practices in the management of unsealed roads including practical aspects during field testing and site inspections. The workshop will encourage group participation, including sharing experiences, field laboratory and site testing and inspection of various unsealed road sites. Attendance at the popular workshops will be invaluable to learn and share knowledge and experience with other participants. Asset management activities, identifying network pinch points, intervention levels for unsealed roads, when to seal? Environmental considerations including dust, water (sedimentation & erosion), protection (flora & fauna). Capitalising on her degree in Materials Engineering and Science from Monash University, Melissa has been immersed in applied research and consultancy projects in the bitumen, asphalt and pavement materials space. During her time at ARRB she has gained extensive experience in laboratory testing of bitumen and asphalt and has also worked in the Asset Management and Knowledge Transfer and Marketing groups. Melissa was the Technical Secretary of the Austroads Bridge Conference 2014 and Co-Technical Secretary of 27th ARRB Conference 2016. Her current work in the Sustainability and Resilience Work Group sees her tackling projects on topics such as the use of recycled materials such as crumb rubber and plastics in road infrastructure and fit for purpose use of materials in unsealed roads. In 2017/2018 Melissa has undertook a 14 month secondment to VicRoads as a Pavement Technology Engineer, Asset Services as well as undertaking the role of Road Delivery Engineer for the Maintenance Team, Metropolitan South East. Stephanie Davy is an enthusiastic professional with 5 years of experience in business development and client engagement. Her experience includes project management of data collection projects for local government and private industry. In her current role with the Transport Safety team, Stephanie is undertaking research to evaluate the effectiveness of a range of infrastructure treatments, to achieve safety improvements for road users at intersections across Victoria. Prior to her involvement in transport safety, from September 2015 to February 2017 Stephanie worked in the data collection team where she acted as a client liaison, facilitating the communication of client needs with ARRB staff, primarily during the pre-contractual phase of project scoping. With qualifications in Science Communication and Engineering, Stephanie offers a unique skill-set combining technical understanding with a strong focus on effective communication. Dr Grenfell is a Senior Pavement Engineer at Australian Road Research Board (ARRB). Since joining the pavement team in February 2017, his work has focused on current Austroads projects looking at the improving knowledge of foamed bitumen stabilised pavements and the use of lightly cemented materials in pavement construction. Prior to this Dr Grenfell spent 13 years as a researcher at NTEC (Nottingham Transportation Engineering Centre) at the University of Nottingham in the UK. Andrew worked in the Materials Science team from November 2011 to June 2012. This primarily involved work on asphalt mix designs and pavement testing, as well as projects on unbound materials, bitumen and concrete. From June 2012 to August 2013, Andrew worked in the Safe Systems team and was involved with speed management and data analysis projects, as well as studies into a number of treatment types for Safe System projects. Andrew moved to the ARRB Brisbane office in September 2013 as part of the Pavement Technology team, where he has worked on research projects in the fields of asphalt technology, unbound granular materials, asset management, economic evaluation and emerging technologies. Tyrone Toole has over 25 years in-depth experience in a wide range of highway engineering and management projects, and in institutional development and training in over 15 countries. He has specific experience in research and the provision of advice in the management and design of low and high volume roads in developing, emerging and developed countries. Tyrone is a leading contributor and co-author of a number of international publications on pavement design, low volume roads and road management systems. Federal, State and Local government (Road managers, engineers and field crew). Resource Groups (Forestry, Mining, Gas, managers, engineers and field crew). Contractors (Contract managers, road engineers, supervisors and field crew). Government officers (Elected officials, CEOs and other senior management). This is an extremely popular workshop so register now to secure your spot!